and Marathi Medium Schools. There are total 606 Teachers jobs in this Adivasi Vikas Vibhag Recruitment 2019. Available posts are Primary Teachers, Secondary Teachers and Junior College Teachers. Interested candidates can apply online for this Nashik Adivasi Vikas Vibhag Teachers recruitment 2018 notification. Official website to apply online is http://maharecruitment.mahaonline.gov.in. Online application link active dates are 12-12-2018 to 06-01-2019. 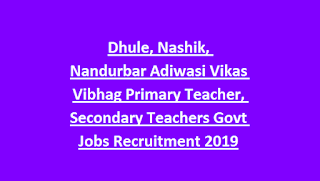 More details regarding this Maharashtra Dhule, Nashik, Nandurbar, Jalgaon and Ahmednagar Adiwasi Vikas Vibhag Teachers Recruitment 2018 is given below. 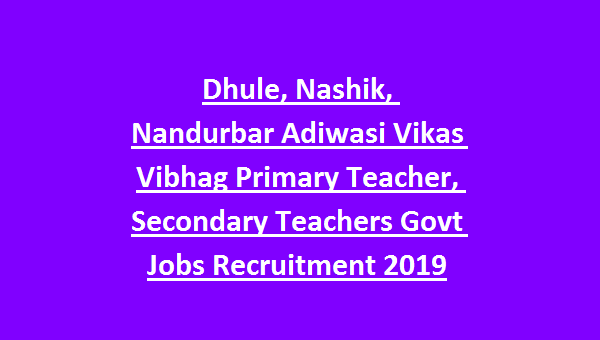 There are total 606 Teachers jobs in this Maharashtra Nashik Adivasi Vikas Vibhag Recruitment 2019. Age limits are 18-43 years for teachers posts. For Primary Teacher D.Ed with TET qualification having candidates are eligible to apply. For Secondary Teaches B.Ed with Degree or its equivalent qualification is required to apply. As per the Tribal Development Department norms of Maharashtra. Candidates selection will be based on interview for this Teachers recruitment in various schools which running under Maharashtra Tribal Development Department. Interested candidates can apply online for this Nashik Adivasi Vikas Vibhag vacancies. Before submission of application please read the below given notification. Official website to online form submission is http://maharecruitment.mahaonline.gov.in.